After Game 3, the Houston Rockets were cooked. Toast. Absolutely done. Today, they’re halfway to history. After Game 3, the Houston Rockets were cooked. Toast. Absolutely done. Today, they’re halfway to history. No team has ever come back from down 3-0 to win a series, but it’s suddenly being discussed as a possibility after the 8th-seeded Rockets stunned top-seeded Oklahoma City 107-100 Wednesday night in Game 5 before a soldout crowd at the Chesapeake Energy Arena, cutting the Thunder’s series lead to 3-2. James Harden went berzerk, hitting his first seven three-pointers en route to 31 points and 8 boards on the night, while Omer Asik made the Thunder pay for intentionally fouling him over a four minute stretch late in the fourth quarter, knocking down 8-12 free throws. I made the drive up this morning to Oklahoma City and am thankful I did — it was en exhilarating experience to be here live. I’ve been to numerous Rocket games in my life that have been just tremendous to witness in person, but there’s something uniquely thrilling about watching your favorite team on the road in front of 18K+ fans that want to rip them to shreds. Because of that atmosphere and the do-or-die stakes, that had to be one of the best experiences I’ve ever had watching the Rockets live. How fortunate are we that Kevin Durant did not successfully get off and make that three at the end of Game 4, completing a sweep and setting up the “Durant is a superstar and Harden is not” narrative? James has had a rough series, but getting to Game 5 gave him the opportunity to squeeze in this gem of a performance against his former team. After going 4-25 from beyond the arc in the first four games combined, Harden hit his first seven three-pointers. He stepped up tonight. Big time. Kevin Martin: Scored 3 points after missing his first 9 shots from the field. Harden: 31 points, hit 7-9 from three. Not a bad trade. Patrick Beverley is all-out, all the time. Gutsy, energetic, battle-tested… this guy is not playing like any rookie I know. I thought he played very well despite a chorus of boos every time he touched the ball. He logged 39 minutes, finishing with 14 points and 8 boards, and knocked down a couple of big threes. I think Jason Friedman of Rockets.com made a great point when he tweeted, “With teams like Utah, Dallas and others so desperate for a point guard all year, the Rockets signed a readily available Beverley.” There are a number of teams with lousy backup point guards (and a few starting point guards) and the Rockets scooped one up from Russia who has stepped right in to start and is playing well enough to be a podium invite after playoff games. This is a major credit to Daryl Morey and staff… and it’s worth another reminder that he’s signed for two more years at a bargain price. Francisco Garcia becoming the X-Factor in this matchup is probably one of the biggest surprises of any playoff series so far. Keep in mind, this is a guy who played 18 minutes combined in the first two games of the series, and most of that was garbage time in a Game 1 blowout. He was brilliant in the first half, popping off for 14 points on 4-8 from beyond the arc, and he hit the dagger three that sent the OKC faithful to the exits. Pesky defense and long range accuracy — Garcia is providing both. Loved the minutes from Aaron Brooks tonight… great to see him as a solid contributor once again. He did not have his stroke from beyond the arc (0-3), but he had a few nice drives and tough shots in traffic. 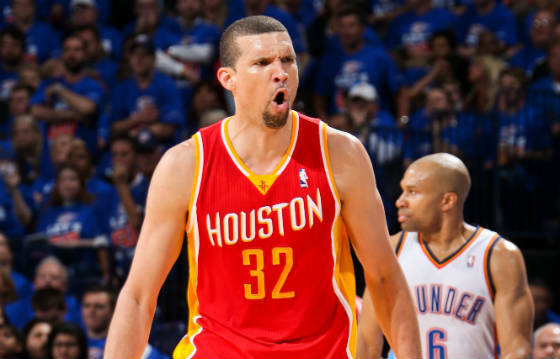 The Rockets wanted an insurance policy for a guy who played all 82 games this year. You don’t think you need it… until you need it. It is paying dividends. In the first four games against the Thunder this year, the Rockets gave up 120.8 points a night on average. In their last four, the Rockets have held them to 103.0. Russell Westbrook’s injury plays a role here, but this is the primary reason Houston is back in the series. The locker room scene after the game was terrific. There were a lot of smiles and fist bumps — the Rockets really are confident in one another. Assistant coaches confessed that they felt strongly that these guys were going to respond, and they did. There’s no talk of a series win … only the next game. The Rockets shot 27.8% on the long ball in their first three games of the series — all losses. They’ve connected on 41.9% in their last two — both wins. Hitting threes is mandatory for the success of this offense. If the Rockets are knocking down triples, they are tough to beat. I tip my hat to the Thunder and whatever magic they have bottled up here at this arena. It’s absolutely like a college game atmosphere — these fans get it. They are in their seats at tip off — all of them — standing and clapping in unison to the music like they were trained by some Cold War general. It’s intimidating and I can see how an opponent winning here, beyond just facing the talent of the Thunder, would be very difficult. Nothing’s “done” here. The Rockets are a long ways away from winning this series as they are still pretty big underdogs, but they’ve made real progress on a big stage here, and for a young team like this, that’s everything. After Game 3, there wasn’t much to build on, especially with how the series had gone for Harden and the injured Jeremy Lin. No one wanted to say it, but a sweep would have been a waste, a lost opportunity. Now we’ve got something: A superstar effort from Parsons. Another from Harden. Role players are making key contributions. There are notches on their belt now, valuable experience being gained. They can see it, we can see it and, more importantly, Dwight Howard and other free agents can see it. There’s a lot of fight left in the Rockets still, but it was never about this season — it’s about the future — and right now, that is being set up quite nicely.